Looking forward to a long road trip, an amazing road race, or just a joyful cruising? You need to appraise the benefits of your riding gear in addition to their overall looks. We bring you, unflinchingly, the best Motorcycle Leather Pants out there, for city commuting, excursion and even adventure biking from Wicked Stock. 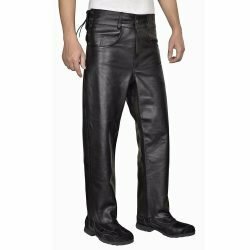 Here is a rundown of some features, of leather motorcycle pants for men from Wicked Stock, that give them an edge over motorcycle pants from other brands specializing in motorcycle gear. 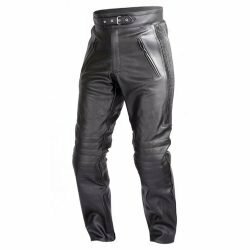 Motorcycle Leather Pants from Wicked Stock come in myriad styles that suit casual riders to true-blue bikers, from understated individuals to the outrageous ones, from classic plain chaps to Mens Motorcycle Race Style Leather Pants. 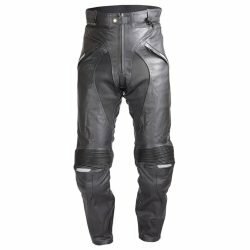 We have leather pants with pucks, riding pants with multiple layers for multiple seasons, race style snug fit pants and jeans style leather pants. The Leather Motorcycle Pants from Wicked Stock come equipped with CE certified hip and knee armor that are highly impact-absorbing and shock-sustaining, giving protection in case of high-speed crashes or multiple spills. These Leather Race Pants are made from 1.2-1.3 mm Full Grain Cow Leather that adds to its durability and facilitates protection against abrasion in a riding crash. 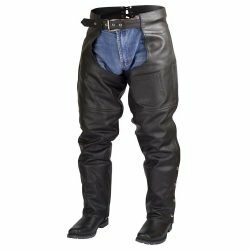 Purpose-built for riding, these leather pants come pre-installed with two EN-1621-1 CE certified 8 mm thick foam pads for hips, that are removable. There are also two solid sport knee sliders that are held in place with strong fasteners. Strengthened with premium quality leather, armors and robust stitching, these are tailor-made to keep you safe in case of an unforeseen rendezvous with asphalt. This high-quality leather also alleviates the effects of weather such as excessive heat, cold, rain and other elements that tend to damage other stuff like cotton, denim etc. There is a Fixed inside mesh liner throughout the pant for enhanced air circulation and ease of use. Premium Fabric Stretch panels on back knee area provide comfort and moisture wicking. Zippered cuffs, 360 degrees and 8″ pant-jacket integration zippers allow the pants to be worn and connected with a wide range of Wicked Stock leather jackets. We have a flexible exchange policy to make sure you are 100% satisfied with the fitment of the garment. 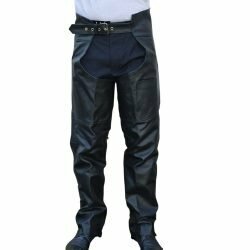 Please have a look at the detailed product pages for Motorcycle Leather Pants online at our store to pick the right pair of pants for a safe, stylish and comfortable riding experience. 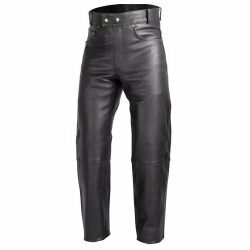 As protective as good-looking, Wicked Stock Motorcycle Leather Pants are sure to become a favorite in your moto wardrobe!